GREAT BEAR LODGE Location: About an 80-kilometre seaplane flight from Port Hardy in British Columbia. Types of bears: Mostly grizzly bears, but some black bears too. 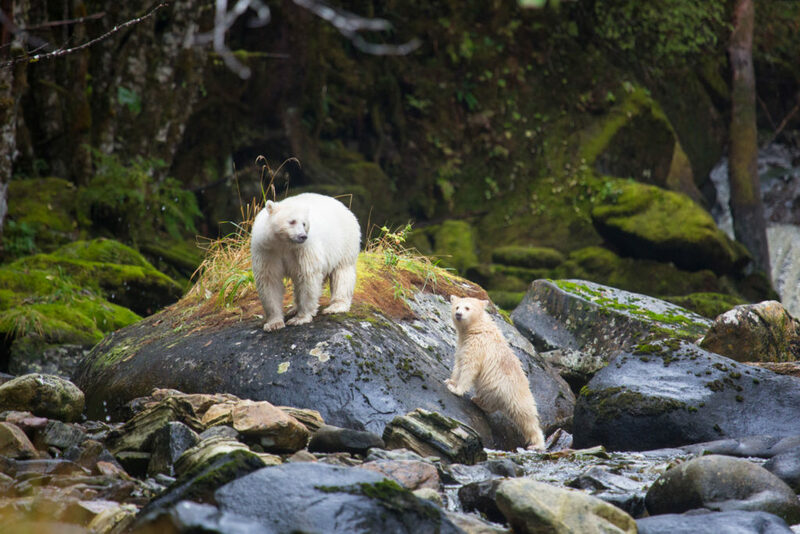 Why it’s so special: Great Bear Lodge tours have exclusive access to a valley in Great Bear Rainforest – renowned as being incredible bear-spotting territory. This means schedules don’t need to be tailored around other companies accessing this special part of the world. Great Bear tours are also deliberately small, accommodating no more than 16 guests at a time to ensure bears aren’t distracted by too many humans, and travellers have a more intimate and personalised experience. All guides are wildlife biologists and have extensive training in working with the bears. What to expect: You’ll be flown in to the secluded Great Bear Lodge via seaplane, and on occasion will also be welcomed by resident seals and otters investigating the ruckus. The lodge itself is a boutique floating design, which only opened in 2014 to replace the previous guesthouse, upping the ante in space and comfort. 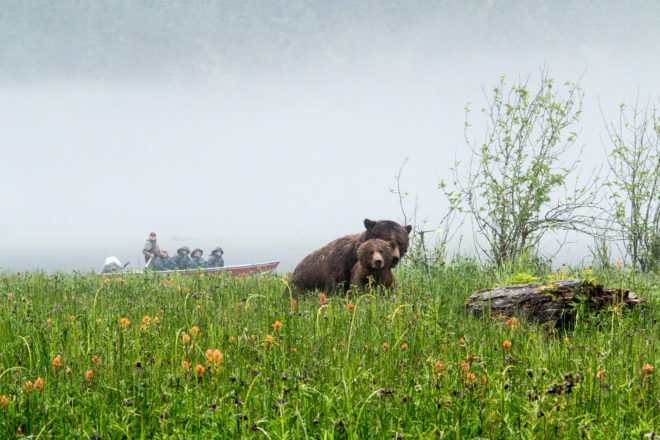 When not inside and sampling the handiwork of the onsite chef (who specialises in “wilderness-gourmet cuisine”), you’ll be treated to two bear-viewing sessions per day, as well as an additional activity such as a guided nature walk or a boat cruise to explore another part of the ecosystem. Hot tip: Visit during the spring breeding season between May and June, and not only spot bears, but see the valley come alive with wildflowers and the calls of birds. A friendly neighbour of Spirit Bear Lodge. Grizzly bear in Alberta, Canada. Bear Cave Mountain Camp in the Yukon, Canada. Interested in getting closer to nature when you travel? You’re certainly not alone. While some people are satisfied with clapping eyes on a few exotic birds during their dalliances out in nature, others are seeking something a little more on the, shall we say – grizzly – side? About an 80-kilometre seaplane flight from Port Hardy in British Columbia. Mostly grizzly bears, but some black bears too. Great Bear Lodge tours have exclusive access to a valley in Great Bear Rainforest – renowned as being incredible bear-spotting territory. This means schedules don’t need to be tailored around other companies accessing this special part of the world. Great Bear tours are also deliberately small, accommodating no more than 16 guests at a time to ensure bears aren’t distracted by too many humans, and travellers have a more intimate and personalised experience. All guides are wildlife biologists and have extensive training in working with the bears. You’ll be flown in to the secluded Great Bear Lodge via seaplane, and on occasion will also be welcomed by resident seals and otters investigating the ruckus. The lodge itself is a boutique floating design, which only opened in 2014 to replace the previous guesthouse, upping the ante in space and comfort. When not inside and sampling the handiwork of the onsite chef (who specialises in “wilderness-gourmet cuisine”), you’ll be treated to two bear-viewing sessions per day, as well as an additional activity such as a guided nature walk or a boat cruise to explore another part of the ecosystem. Visit during the spring breeding season between May and June, and not only spot bears, but see the valley come alive with wildflowers and the calls of birds. In Manitoba’s Wapusk National Park. 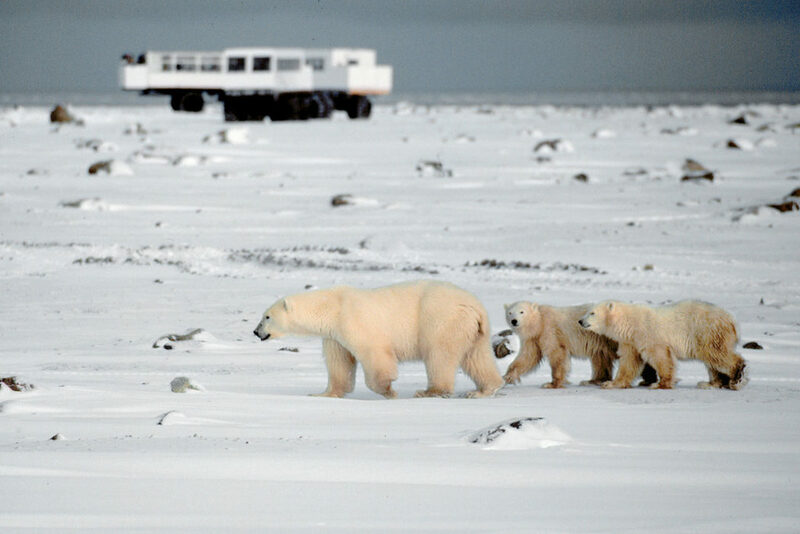 The Legendary Cape Churchill Expedition is Frontiers North’s most exclusive adventure, available to only 40 guests per year. It’s also the only bear-spotting experience available to travellers within Wapusk National Park – home to one of the largest polar bear denning areas in the world. During the day, guests explore the area on board Frontiers’ iconic ‘Tundra Buggies’ – specially built all-terrain vehicles that are high above the ground…and the bears. There’s no shortage of world-class photo opportunities either, out of opened windows or on the observation deck. It’s not uncommon for curious polar bears to jump up on the side of a Tundra Buggy to get a closer look at their visitors, looking guests right in the eye. During your stay, you’ll sleep inside Frontier’s Tundra Buggy Lodge – a mobile lodge located in the very heart of the Churchill Wildlife Management Area. Here guests can fall asleep and wake up with polar bears right outside their window. Similar to a train, the lodge features accommodation for 40 guests, a lounge car and a dining car. Each night you’ll be treated to home-cooked meals created by the in-house chef, presentations by top polar bear researchers from Polar Bears International, and the opportunity to view the northern lights from the open observation decks (weather permitting). Then during your daytime wildlife safari on the Tundra Buggies, you’ll be accompanied by professional and knowledgeable interpretive guides. Although polar bears can be seen in Churchill between July and November, from October onwards is considered peak season due to the high number of bears that roam the area. Churchill, Manitoba is also known as the beluga whale capital of the world, and if you visit during July and August you can see hundreds of beluga whales in the Churchill River. Grizzly bears are the most prevalent, but you can also spot black bears and the rare spirit bear. Spirit Bear Lodge is owned and operated by the local First Nations band – many of the staff members have lived in this remote part of the world their whole lives along with their ancestors tracing back to time immemorial. Their culture and history are incorporated into many aspects of the tours. Due to this deep connection with the land and the wildlife within it, Spirit Bear Lodge guides are particularly adept at knowing the best locations to view the exceptionally rare spirit bear. They also work closely with distinguished biologists to learn more about bear behaviour and ecology, passing this insight and information onto guests. Here you’ll travel in small groups by motorboat, exploring the temperate rainforest and ecological wonders of Princess Royal Island, home to the world’s only Kitasoo Spirit Bear Conservancy. There’s some incredible photo opportunities too, as you interact with an abundance of wildlife in their natural habitat. While there are no guarantees in seeing a spirit bear, it is suggested guests book a five-night stay for more opportunities to have an encounter with this special wild animal. Fishing Branch Territorial Park in the Yukon. Ice bears, which are in fact grizzlies but get their name from the ice that covers their fur. Isolated from roads and development, the unscathed land of Bear Cave Mountain is worth the visit alone, with its thermal springs, craggy mountain peaks and an abundance of salmon. 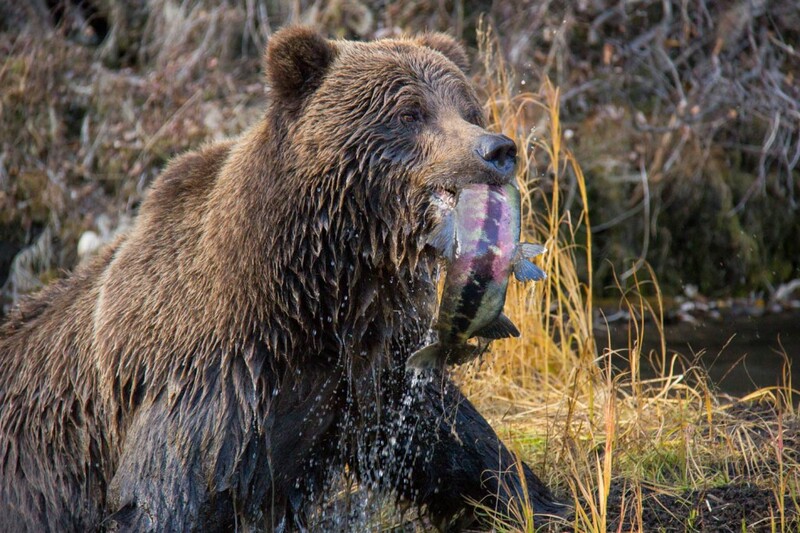 Every Autumn (September and October), as many as 40 grizzly bears can be seen along the river bank, eating their fill of salmon in preparation for hibernation. By mid-October, winter settles in and transforms the grizzlies into ‘ice bears.’ It’s a bucket-list spectacle that combines the beauty of Canada’s northern reaches with its infamous wildlife. You’ll arrive at the remote Bear Cave Adventures camp via helicopter, surrounded by divine Yukon wilderness. The camp itself is comprised of heated guest cabins and a main lodge, which houses a kitchen and dining room where you’ll sample impressive cuisine by on-site chefs three times a day. However the real drawcard is the designated bear-viewing sites around the camp, where you can watch ice bears going about there business with highly-trained professional wildlife guides. The viewing sites are within easy walking distance of camp and provide optimum light and weather conditions for filming and photography. If you’re lucky, you might also spot the occasional moose, wolves, caribou or marten. Another great time to visit the Yukon is in May, when local bears are coming out of hibernation and are often spotted on the roadside, grazing on dandelions with their cubs. As the land turns green with new season grass and vegetation, the bears tend to move deeper into the wilderness. 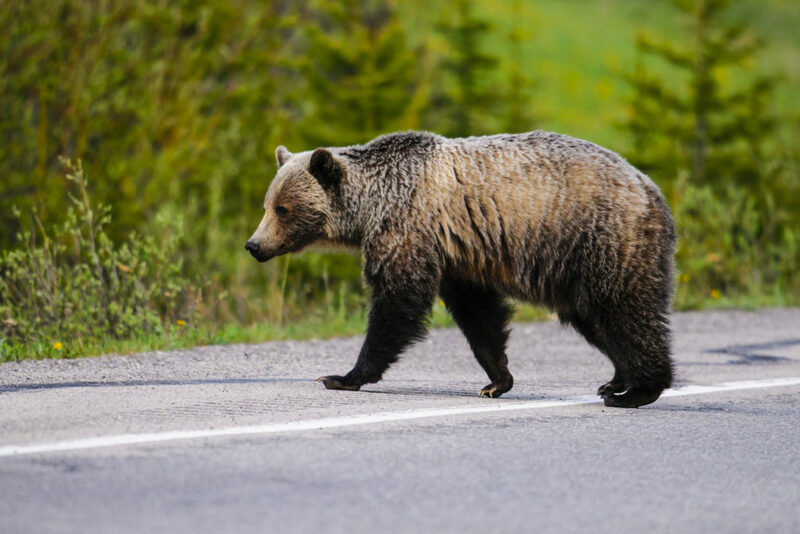 The most common places to spot bears here are Waterton Lakes National Park on the drive out to Red Rock Canyon, Jasper National Park on the drive out to Maligne Lake, Banff National Park along the Bow Valley Parkway and on the outskirts of town. Black bears and grizzly bears in higher alpine areas. Unlike other areas in Canada, Alberta doesn’t have bear-viewing lodges, so it’s about being in the right place at the right time. Happily, Alberta is teeming with wildlife, including bears, and offers accessible and rewarding wildlife viewing year round. The best way to see bears in Alberta is to jump in the car and drive around less inhabited areas at dawn and dusk when bears are most active and usually spotted grazing in the grasslands. Major animal sightings, including grizzly bears, occur almost daily at the Lake Louise Gondola with the highest concentration of bear sightings in June, July, August, and September. If you want a guaranteed wildlife sighting in Alberta, visit Yamnuska Wolfdog Sanctuary at Cochrane on route to Banff National Park, where you can interact with wildlife and learn about wolves and wolf-dog behaviour in the wild. Would are our chances be higher if we booked to see bears in end May or early June? Summer is usually the best time to see bears in most parts of Canada, so June should just edge out May. Regards. The best timing often varies depending on where the bear viewing site is located, but in our valley at Great Bear Lodge mid-May to mid-June is a great time to see the bear during mating season. Hello, I’m planning to visit Canada in October. I’m from Brazil and I want to experience some bear spot. I’m interested in 3 of these spots that you commented. How can I contact some guide to schedule this tour? Thank you, Cintia. Hi Cintia, It’s possible to book directly with the lodges in the story. Follow the links of your favourites. Best of luck in your bear quest – and let us know how it goes. Regards. October is a great time to see the bears, just before they head off to hibernate for the winter. They are fat and furry and very relaxed. As Steve mentioned, you can contact us at Great Bear Lodge or one of the other operators by clicking on the links in the article.